Is This A Joke? Did WaPo Really Fact-Check Trump Over His Fast Food Dinner With The Clemson Football Team? In other comments, Trump — in true Trump fashion — suddenly more than tripled the hamburger count. Had Trump instead invested his entire net worth — $3.1 billion per Forbes last year — on $5 sandwiches, each two inches high? A stack of hamburgers nearly 20 miles high. Okay, that last part makes me think this was a joke, a poke at conservative media who love to highlight the liberal media’s endless string of failures when covering this White House. The silver platter remark, the analysis of the food, the calories, and the bill—it all reads troll bait to me. The liberal media is dense, but they’re not that thick. Okay—some definitely are, but I think this was an attempt at a joke. 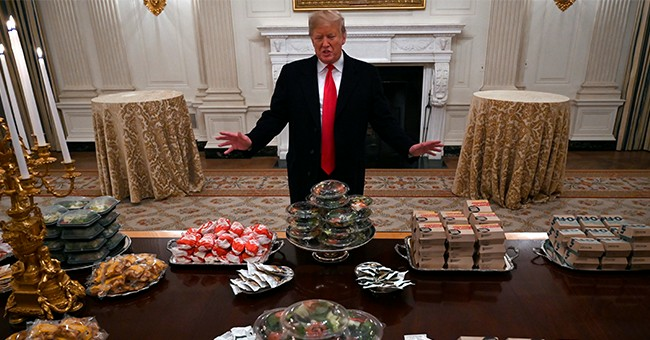 If it was, it was not the best one since the liberal media has become so petty and hostile that they would fact-check the president over hamburgers. So, it’s an exercise in a lack of self-awareness. If this was indeed meant to be a serious story, then all is lost. The mainstream media has reached a new level of silliness not seen since CNN couldn’t report on Trump feeding koi fish accurately. In the meantime, the Clemson football team celebrated their championship win and enjoyed their visit to the White House. Quarterback Trevor Lawrence said he had a tremendous time and hopes to be back again. Did you hear that Alabama fans?